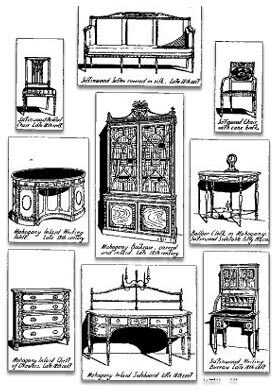 Antique Terms S – The antique marks glossary covering everything from sabino to sabre and sevres to syllabub. A glossary of antique related terms definitions and meanings. Finnish-born US architect and designer. Saarinen worked with fellow architect Charles eames and explored the use of plastics in furniture, producing the first moulded plastic chairs. His Tulip chairs and tables of 1957 used moulded glassfibre with aluminium supports in the base for extra strength. 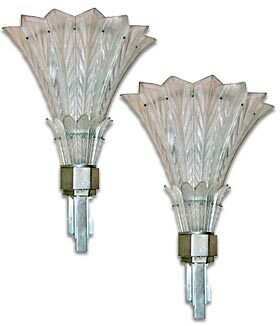 French glass-maker of the art deco period, especially 1923-39. Sabino’s work imitated many of the glassblowing techniques and decorative motifs of his contemporary René lalique. Early 19th-century curved chair leg which resembles the line of a sabre blade, most closely identified with the regency period. From 1815 a sabre leg was sometimes referred to as a Waterloo leg after the Battle of Waterloo. A decorated flat pouch suspended from the belt of cavalry officers and worn until the early 20thC. Solid wooden seat with two slight depressions separated by a central ridge, commonly seen on Windsor chairs. It is also a term for a wide, U-shaped seat. Three-legged, solid wood stool with saddle-shaped seat. A famous 19th century portraitist and the favorite painter of King Ludwig I of Bavaria who devoted a picture gallery (the ‘Schonheitsgalerie’ in the Schloss Nuremberg, Munich, Germany) to beautiful women of his kingdom. The name given to Oriental rugs with designs of multiple prayer niches, or mihrabs. Examples, often fragmentary, are known from the 16thC. The mihrabs on many safs are small and close together suggesting they were not used as prayer rugs but as decorative wall-hangings. A fireclay vessel used to hold and protect objects during firing. General term for any container used for table salt, ranging from the large, ceremonial standing salt of the 14th to 16th centuries to the more common salt cellar (a shallow, open bowl) and salt caster (similarly shaped to a sugar caster but smaller). Salt cellars are often gilded or have a glass liner to prevent corrosion by damp salt. A trencher salt, most popular 1640-1750, has no feet and rests flat on the table. Plate or tray, usually of silver or silver-gilt, used for the formal offering of food, drink, letters or visiting cards. Large, heavy, oblong or oval silver salvers evolved into what we know as trays in the 18thC. Small, flat salvers are known as waiters. Glass salvers, popular in Britain from the 18thC, usually have a central stem like a tazza. An officer’s belt designed to support a holster and sword. It has crossed belts and was named after General Sir Samuel Browne, VC, a one-armed British officer who is said to have designed it. An embroidered panel of fabric sewn as a reference or as a demonstration of a range of different stitches. Founder of one of France’s best-known 19thC reproduction porcelain and earthenware factories, c1845. The firm initially specialised in providing replacements for 18thC sevres, meissen, chelsea and derby figures and Chinese services. Gradually copies of wares from all the well-known European factories were produced. Pieces usually carried Samson’s own mark based on the appropriate original, but this was often removed by people wishing to pass on the pieces as genuine. Chinese term meaning ‘three colour’, used to describe an effect created on ceramics by using three mineral colours in a glaze, usually yellow, green and brown (sometimes dubbed ‘egg-and-spinach’). Instrument for measuring time, consisting of two bulbous glass chambers connected by a narrow channel. The whole is often mounted within a wooden frame for stability. Upending the device allows a quantity of sand to trickle from one chamber to the other taking an exact period of time, usually one hour. Sand glasses, which preceded clocks and watches, were manufactured from the 16thC, but they were not made in Britain until c. 1610. Process used for creating matt surface finishes on glass, invented in the USA in 1870. A design area is masked off and the object is subjected to a high-pressure jet of sand or powdered iron to leave the exposed area with a rough, greyish finish. Technique of shaping glass or metal objects where the design to be cast is formed in a mould containing fine casting sand and other ingredients. Sang de boeuf, the phrase refers to the striking blood-red glaze that was first used by Chinese potters hundreds of years ago. The French term literally means "oxblood," and Chinese potters often painted the opaque glaze on a white base that simulated bone. In areas where the glaze lies thickly on the ceramic body, such as near the base of a vase, it forms dark patches like coagulated ox blood. Chinese Imperial artists, aware of the glaze’s beauty, protected its formula for centuries. The Sang de boeuf effect is achieved by firing a copper glaze in a reducing atmosphere, one rich in carbon monoxide and was developed in the late 17th and 18th centuries in China simultaneously with flambé glazes. European potters imitated the technique in the 19thC. Red was always a difficult glaze for potters to render and the sang de boeuf hue proved even harder to replicate. Rookwood attempted to reproduce the red in the 1880s, but had mixed success before the 1920s. The English and American potters Anglicised the French term for the Chinese glaze, referring to it simply as oxblood. The English potter Bernard Moore had success with the glaze in the early 20th century, and James Robertson, who established Chelsea Keramic Arts Works in 1872 in Massachusetts, also approximated the prized color, although his experimentation mimicking beautiful Chinese glazes eventually led to his bankruptcy. The formula for the glaze became common knowledge by the 1920s. Sang de boeuf pieces fired before that time are still sought by collectors, largely because they’re so rare, but the colour can be produced quite easily today. Newly formed, soft whitish wood of a tree between the outer skin of bark and the central core of heartwood, also known as alburnum. Cloth made of silk threads or other material, made shiny by being passed through heavy rollers. Satin is used for dresses, coats, curtains and sometimes upholstery. The reverse, duller side of the fabric is known as sateen. Where satin and sateen are combined to form a pattern, the fabric is known as a damask. Satinet is an imitation satin mixed with cotton or rayon, usually used for dress fabrics. Smooth, fine-grained yellowish wood, popular for furniture from the late 18thC. West Indian satinwood became fashionable c. 1770, and the paler East Indian variety in the early 19thC. Both were used for veneers, decorative panelling, and inlaid decoration. In addition, the pale colour made satinwood an ideal surface for painted decoration. See also harewood. The western name for a type of Japanese earthenware exported throughout the world since the meiji period (1868-1912). Mock marble or imitation pietra dura made from plaster of Paris or clear crystals of gypsum (selenite), various pigments and chips of marble. It was produced in ancient Rome but revived in 16thC Italy, and imported to Britain for interior architectural features such as columns and wall panels in the 18thC. Scagliola was also used for the tops of tables and commodes, and increasingly, from the 1790s, when Britain produced its own, for dwarf columns and pedestals. A 17thC medical instrument, consisting of a number of blades released by a sprung trigger, which was used for letting blood. The blades made several incisions on the skin at once, and from c. 1800 were also used for preparing the skin for vaccination. Form of German glass and ceramics decoration in black, late 17th and early 18th centuries. The landscapes, figures and flowers are often fleshed out with iron-red and sometimes gilding. Scotland has been involved in glass-making since the early 17thC. The first glassworks was founded at Wemyss, near Glasgow, in 1610, but the industry became centred in Leith, Edinburgh, from 1628. At first only green bottles were produced; in fact, from c. 1664 it was illegal for the Scots to buy bottles from anywhere else. But by the end of the century Leith wares included drinking glasses and novelties known as friggers. Other centres of glass-making were established at alloa, Prestonpans and Perth. Since the 1860s Edinburgh has become well known for its fine lead crystal. A sgraffito technique on white salt-glazed stoneware with the decoration incised into the surface and filled with blue (or brown) pigment prior to firing. The technique was produced mainly by staffordshire potteries c. 1724-76 and revived in the late 19thC by artists such as Hannah Barlow at doulton. Simple decoration on 16thand 17thC furniture. Designs consist of single lines carved into the surface of the wood. Engraved stamp for impressing a design or monogram onto sealing wax or for printing it on paper. Used since ancient times, ornamental seals returned to fashion in the 16thC when they were worn by men on a neck chain or chatelaine, in the 17thC on watch chains, and during the early 18thC Regency period suspended from small fobs at the waist. Small seals are also found set into finger rings, and at the other end of the scale set in large, sculpted mounts with heavily ornamented handles. Various materials were used for the seal matrix and its setting, including various gemstones. Glass seals, mounted in gold, silver, brass or steel, were popular from c.1740. A seal box is a small, usually round, silver or gold container similar to a snuffbox, and used to hold the official seal for important documents. They are often engraved on the lid with the crest of a city or institution such as a university. Prominent citizens given the freedom of a city were often presented with a seal box known as a freedom box. Flowing marquetry style popular on william & mary furniture from the 17th and early 18th centuries. The effect was achieved by setting a light wood such as holly or box against a contrasting dark walnut ground in seaweed-like patterns. Chest of drawers with a desk area concealed behind a false drawer-front. Instead of the angled fold-down bureau, the top ‘drawer’ pulls out and the front drops down to form a writing surface and reveals recessed pigeonhole compartments and small drawers behind. Secretaires were introduced during the late 17th to early 18th centuries. Portable enclosed chair for one person, used by the upper classes in Britain and France during the 16th, 17th and 18th centuries. The chair was fixed on poles on either side and carried by two men. A person could be carried from one house to another without setting foot outside. When not in use, sedans were kept in the entrance hall of large houses. Small, portable, early 19thC timepiece, sometimes used in a sedan chair. It has a brass-bound, rectangular or circular, turned mahogany or toleware case with an enamel watch dial. Sedan clocks provided one way of recycling 18thC watch movements which were too thick for the slim-cased pocket watches then in vogue. Cabinet-maker and founder of one of the best-known firms of British furniture-makers which was a rival of the Lancaster-based gillows. It employed hundreds of craftsmen during its heyday in the 1780s. French boxes, cupboards and chests of drawers with seven compartments, one for each day of the week. The nearest British equivalent was the wellington chest, made in the mid-19thC. Term used to refer to all gemstones except precious stones. Gemologists and jewellers consider the description too general and refer to stones by individual names. The term does not apply to synthetic gemstones, glass and paste or to organic substances used in jewellery, such as amber, coral, jet and tortoiseshell. Descriptive term for an undulating profile, especially in furniture. Serpentine fronts, with a convex curve in the centre flanked by slightly concave sides, were seen on rococo chests of drawers, cabinets and sideboards in the 18thC. From the late 17thC, some chairs had curving serpentine stretchers. Also – Mineral which ranges in colour from various shades of brown to shades of green, and is often mottled in appearance. The green varieties are the most valuable and sometimes resemble nephrite jade. Serpentine is used for carving cameos and intaglios as well as in architecture as a decorative stone. Bowenite is a harder variety of serpentine and cream, grey or pale green in colour. Japanese ceramics centre, in production from the 9thC. It is best known for its 19thC vases and useful wares decorated with paintings of birds, fish and landscapes, mostly in underglaze blue. Upholstered seat with back and arms for two or more. Long wooden bench with arms and a panelled back which was designed to seat two or more people. A high-backed settle – sometimes with storage space beneath the seat or a cupboard in the back – was a familiar sight on either side of the hearth in farmhouse kitchens and inns from the 16th to 19th centuries. A settle table is a wooden settle with a hinged back that folds over to rest on the arms and form a table. French national porcelain factory and a leading influence on European ceramics fashions c1760-1815. Soft-paste porcelain was manufactured exclusively from c1740 until the discovery of local china clay deposits enabled true porcelain to be produced from 1768. From the 1750s, Sèvres acquired and maintained its lead in French ceramics, largely due to royal patronage. Navigational instrument using mirror reflections to measure the sun’s altitude, developed from the octant in 1757 by Captain John Campbell. It was not in common use until the mid- 19thC and was made until modern times when periscopic types were used on aircraft. Technique of creating a design on a pottery surface by scratching or scoring through an unfired slip coating to expose the darker body beneath. In 16thC sgraffito ware from the Bologna area of Italy, for example, designs were incised in the white slip coating to reveal a red clay ground. The technique has been much used throughout Europe since medieval times, particularly on country pottery from south-west Britain. It was a feature of Barnstaple pottery throughout the 18th and 19th centuries – and was often inscribed to commemorate special events such as harvests and christenings. Royal Doulton artist Hannah Barlow has become one of the most collectable sgraffito artists. Her studies of typical countryside scenes featuring horses, sheep and cattle on Doulton stoneware are very sought after and can command high prices at local and national auction houses. Typical prices for a hannah barlow vase in fine condition can vary between £800 and £2500 depending on size and subject. Highly polished skin of sharks and sting rays, used from the 17thC for covering knife cases, hip flasks and other small items. Also – Untanned leather, originally made in Persia (Iran), with a coarse, granular finish and usually dyed green. Furniture made by the Shakers, a puritanical community in the USA founded by emigrants from Britain in 1774. The Shaker men made articles notable for their simplicity of construction and appearance, economy of design and material, yet high quality of craftsmanship. The styles remained unchanged until the late 19thC when output and quality declined as the communities decreased in number. A style of military headdress. The name is used for a variety of caps, the most common feature being a tall, cylindrical crown and a small peak. British soldiers wore shakos for much of the 19thC. A sabre originating in India and Persia (Iran), with a long, slender curved blade designed for making slashing cuts. A common type of shamshir has a mameluke hilt, with a crossguard terminating in acorn-like finials and a pommel curving over at right angles to the grip. Thin layer of silver fused to a sheet of copper. Also known as ‘Old Sheffield’ and fused plate, the process effusing the precious and base metals together by heating and rolling was invented by Thomas Bolsover in Sheffield in the 1740s. In the 1760s, the introduction of double-plating (which coated both sides of the copper sheet) made Sheffield plate a more convincing, lower cost alternative to objects made of solid sterling silver. Wire made by a similar process widened the scope of design to include openwork and wire work articles. The difficulty of concealing the copper at the edges, and of the proneness of the silver coating to wear, to some extent limited the range of products to luxury hollow-ware salvers, cruets, bread or cake baskets. Sometimes, part of an article, such as the stand of a tureen, would be made in Sheffield plate, the main body in sterling silver. The introduction of electroplating from 1840 made Sheffield plate obsolete by 1880. Sheffield plate is usually unmarked except for the maker’s name in some cases. English term for sakura-ningyo -Japanese dolls designed as ornaments for a shelf. They are based on legendary Japanese heroes and heroines and have been exported to the West from c. 1900. Varnish made from the secretions of a scale insect on trees in India and the Middle East. It was used by European craftsmen to imitate Oriental lacquer. Shellac, dissolved in alcohol, is also used in french polishing on furniture. Early form of plastic, invented 1868 and used to make gramophone records and moulded ornaments. British cabinet-maker whose Cabinet-Maker’s and Upholsterer’s Drawing Book encapsulated the elegant, neoclassical furniture style named after him. 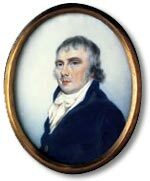 Thomas Sheraton (1781-1806) was born at Stockton-on-Tees and settled in London about 1790. Although trained as a cabinetmaker, he was primarily a designer, whose fame rests on his published works, of which the first and most influential was The Cabinet-Maker and Upholsterers´ Drawing-Book, originally issued in four parts between 1791 and 1794. The Cabinet Dictionary (1803) contains many useful and instructive definitions, as well as practical information about the technique of cabinet- and chair-making. Only about a quarter of his last work, the Cabinet-Maker, Upholsterer and General Artists´ Encyclopaedia appeared just before his death. No pieces of furniture have been traced to Sheraton, so it is highly improbable that he ever had a workshop or ever made any furniture. On his trade card, was the address 106 Wardour Street, Soho, which he had printed about 1795, he announced that he "teaches Perspective, Architecture, and Ornaments and makes designs for Cabinet-makers, and sells all kinds of Drawing Books". This probably gives an accurate account of his activities. 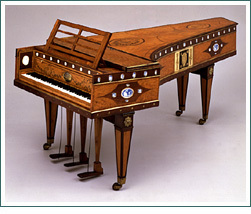 Sheraton is not known to have provided designs for any particular piece of furniture except for one grand piano in satinwood with Wedgwood and Tassie medallions, made in 1796 by John Broadwood for presentation to Queen Maria Louisa of Spain. Sheraton later moved to No. 8 Broad Street, Golden Square. The approximate position of his Wardour Street premises is commemorated by Sheraton Street, between Great Chapel Street and Wardour Street. Sheraton´s Drawing-Book was addressed primarily to the trade and its aim was practical – to acquaint cabinetmakers with the most up-to-date designs. He remarks that in conversing with cabinetmakers he found no one individual equally experienced in every job of work. There are certain pieces made in one shop that are not manufactured in another and he had therefore, applied to the best workmen in different shops, to obtain their assistance in the explanation of such pieces as they have been most acquainted with. He frequently acknowledges his indebtedness to those who had helped him. In addition, he appears to have studied Louis XVI style furniture, which had recently been brought across the Channel, and also the work carried out at the time by Henry Holland at Carlton House. An ardent Baptist, Sheraton published religious tracts as well as furniture designs, and put forward schemes for evangelising the villages around London. Having been ordained a Baptist minister, he left London for Stockton and Marston in 1800, but seems to have returned to London two years later. In 1804, his mind gave way and he died in poverty. Sheraton did not invent the furniture style named after him, he played a leading role in formulating it. His Drawing-Book designs have a remarkable stylistic unity, a marked preference for the simple, sometimes severe, outlines combined with flat (painted or inlaid) decoration of great delicacy and elaboration, sometimes with stringing lines and contrasting veneers in geometrical patterns and sometimes with intricate arabesques or figurative panels. Where many earlier designers (especially Rococo designers) seem almost to have been ashamed of using wood as their medium, Sheratons patterns emphasise its essential qualities. The grains of the veneers are carefully delineated; the forms are those which come easily to craftsmen working with saws and lathes. He made free play with antique ornaments of the type used by Adam (urns, paterae, vases, and swags) but without pedantry. His designs are very elegant and very delicate. Highly decorative lacquer style introduced by Senzo Onogi in Chiba prefecture at the end of the Edo era. Finely finished pieces of ivory, mother-of-pearl, tortoiseshell, horn and other materials are inlaid into gold lacquered, wooden panels, or sometimes ivory grounds. Shibayama lacquers were almost exclusively made for the export market. Shishi (or Jishi) is translated as "lion" but it can also refer to a deer or dog with magical properties and the power to repel evil spirits. A pair of shishi traditionally stand guard outside the gates of Japanese Shinto shrines and Buddhist temples, although temples are more often guarded by two Nio Protectors. The Shishi (like the Nio) are traditionally depicted in pairs, one with mouth open and one with mouth closed. The open/closed mouth relates to Ah and Un. "Ah" (open mouth) is the first letter in the Sanskrit syllabary, while "Un" (closed mouth) is the last letter. The same holds true for the Japanese syllabary. The combination is said to symbolically represent birth and death or to represent the universe and all within it. Others say the open mouth is to scare off demons, and the closed mouth to shelter and keep in the good spirits. The circular object beneath their feet is the Tama, or sacred Buddhist jewel, a symbol of Buddhist wisdom that brings light to darkness and holds the power to grant wishes. This mythical beast was probably introduced to Japan from China and/or Korean in the 7th or 8th century AD, during the same period as Buddhism’s transmission to Japan, for the Japanese shishi combines elements of both the Korean "Koma-inu" (Korean dog) and Chinese "Kara-shishi" (Chinese lion). One prominent theory holds that the shishi derives from the Chinese Foo Dog. Lions, are not indigineous to Japan, China or Korea, and supposedly entered those nations in the form of imported art and sculpture, with the earliest traces of the animal appearing in China’s Han Dynasty (about 208 BC to 221 AD). Glass container 1-3 in (25-76 mm) tall that was filled with lead shot in which to clean and support quill pens. Also – A US term for a small tumbler for a single measure – or ‘shot’ – of whiskey. Simple chair without arms, also known as a single, upright or small chair. General term for any easily movable table designed to stand against a wall, or in a dining room as an additional table for food, plates and dishes, and sometimes referred to as a serving table. Dining-room furniture piece, developed, as it is known today, in the last quarter of the 18thC. Sideboards were designed for the storage and display of tableware and for serving food, and usually have a central drawer flanked by cupboards or drawers. Outline of a figure, either painted or cut out of paper and mounted on card, popular from mid- 18thC to c. 1880, and revived in the 1920s. The fine, lustrous, supple fibre produced by certain insect larvae and spiders, especially the silkworm. Silk cloth was produced c700 bc by the Chinese and remained a closely guarded secret until the 6thC ad, when it spread to France, Spain, Italy and Sicily. The main silk production centres today are southern Europe, Japan, India and northern China. The best-quality silk is net silk which is very slightly twisted, and reflects light especially well. The waste from net silk is spun silk. Silk which has yet to be spun and woven is raw silk, of which there are a number of varieties such as floss silk (for fine embroidery), organzine (for the warp of quality silk fabrics) and tram (for the weft of quality silk fabrics). A printing process based on the stencilling principle, in which a stretched screen of silk or other fine fabric is coated with ink-resistant substance in the design areas to be left blank. Coloured ink is forced through the uncoated areas onto the printing surface. Layers of different colours can be applied using different stencils. Silver plated with a thin layer of gold. British glass, also known as silver-deposit glass, produced c. 1890-1920. A design was painted in a flux, placed in a silver solution and subjected to an electric current, which fixed the silver to the painted surface. Silvery art glass made by enclosing silver foil between two layers of clear glass. The technique was developed by John northwood ii, c1900, and was made at stevens & williams. The silver version of gilding in which a thin film of silver is applied to a surface using silver leaf. The technique was introduced in the latter part of the 17thC and used on elaborately carved cabinet stands and tables. When lacquered or varnished, the silver takes on a yellowish tinge, and was sometimes used as a cheap alternative to gilding. Also – The film of tin foil and mercury, silver or other reflective material applied to glass in a mirror. Monkeys dressed up in human clothing, popular as a decorative theme in the 18thC. It is found in most forms of art and although it was not much used after 1800, it was revived in the 19thC after the publication of Darwin’s On the Origin of Species. See affenkapelle. Barometer that has a J-shaped glass tube containing mercury. The wheel barometer was developed using a siphon tube. Gaelic for ‘black knife’ – a Scottish Highlander’s dirk that was held in the sock against the leg when not in use. Clock with its workings exposed in an open framework, usually housed under a glass dome and mounted on a wooden or marble base. Skeleton clocks were made in France from c. 1750, and became popular in Britain in the Victorian era from c. 1840. Liquid clay used as a finish or as a decorating medium on pottery, or as a medium for casting hollow-ware and particularly figures. Slip, or engobe, is also used to join the various parts of an object figure or group of figures that have been cast in separate moulds. 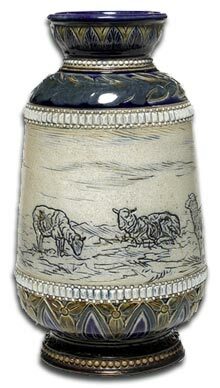 A decorative slip can either be used as a dip or poured over an article of pottery to coat it, or made into a stiffer mixture and piped or slip-trailed (also known as tube-lining) on the surface of the body. The process precedes firing. Mixed clays are used or metal oxides added to achieve different colours and effects. Lightweight and elegant, short sword which dates from the late 17th and 18th centuries. A blue pigment produced by grinding a coloured glass mixture containing cobalt oxide to a fine powder. It was used in the manufacture of bristol blue glass and in powder-blue ground in ceramics. Regency furniture-maker, upholsterer and designer. Smith popularised the circular dining table and the ottoman sofa in Britain and published several books of his designs. His furniture was much influenced in the early years by collector and Egyptologist Thomas hope, and Smith also used gothic and Chinese motifs widely. His later work became increasingly heavy and over-decorated, a foretaste of Victorian furniture. Deep, bright red tropical hardwood with irregular dark markings resembling those of a snake or hieroglyphic characters – hence its names – snakewood and letterwood. Snakewood is difficult to work because of its hardness but is seen as an inlaid decoration on 17thC furniture and occasionally in late 18th and early 19thCveneers. A table with a top that snaps or folds down vertically over the supporting pillar, as in 18thC tripod tables. A form of ignition similar to the flintlock using flint and steel. Small bottles, 2-6 in (5-15 cm) high, used for holding snuff. Most were produced in China from the 18thC and were made from a variety of materials, including glass, ivory, porcelain, agate and jade. The bottles are usually round or oval in shape, with a spoon attached to the inside of the stopper and are often richly carved or enamelled. Glass bottles sometimes have interior painting. Large numbers of Chinese snuff bottles were exported to the West from the mid-19thC onwards. Implement used to trim or cut candle wicks. A form of magnesium silicate, or talc, used in its solid white, red, greyish or greenish form for carved ornaments, particularly in China. In the mid-18thC, particularly in Britain, powdered soapstone, or steatite, was sometimes used as a binding agent in soft-paste porcelain paste. It provides good resistance to sudden temperature changes, improved whiteness and plasticity. Glass made with soda (sodium carbonate) rather than potash (see bohemia) as the flux agent. The soda was originally derived from marine plants (see cristallo), but later produced chemically. In its molten state, soda glass is easier to manipulate than potash glass, but in its finished form it is light and fragile, and cannot be cut. In Britain, soda glass was superseded in the 17thC by lead crystal, which was stronger and more resonant, but continued to be made until the early 19thC on the Continent, and is still used for some Venetian-style glass today. Any movable seat on which to recline, now virtually interchangeable with settee. The word is derived from the Ottoman sopha (the dais on which the Grand Vizier received guests). A development of the pembroke table although narrower and longer, made from the late 18th to mid-19th centuries. There are usually two shallow drawers at the front and normally flaps at both ends supported by fly brackets. Early examples have end supports whereas later tables stand on pedestals. Sofa tables were designed to complement the length, line and height of a sofa, and were typically used by women for writing, drawing or reading. As these early formulations suffered from high pyroplastic deformation, or slumping in the kiln at raised temperature, they were uneconomic to produce. Formulations were later developed based on kaolin, quartz, feldspars, nepheline syenite and other feldspathic rocks. These were technically superior and still continue in production.. Timber from cone-bearing trees which is generally softer than hardwood and therefore easier to work. Softwoods include pine, cedar, spruce and yew. Chinese dynasty, sometimes spelt Sung, of great ceramic development, ad 960-1279. Porcelain was improved and it is the most likely period of the invention of underglaze blue. stonewares were given highly sophisticated glazes in a wide range of colours and the practice of patronage of ceramics was established. The first Song dynasty wares reached Europe at the end of the 19thC and became a source of inspiration for studio potters in France and Britain. Town in southern Germany famed for doll-making. Early dolls of turned wood were produced from before 1700; from 1807, mass-production techniques resulted in the large-scale manufacture of papier-mâché heads. The peak production period, however, started c.1850, from when Sonneberg dolls in bisque, composition, wood, wax and china were produced and exported throughout the world. Late 18thC British bottle stand, similar to a cruet, usually made in silver or sheffield plate. The corner space between an arch or circle and a rectangle. Originally an architectural term for the space between one arch and the next in arcading, it is used in the context of carpet and textile patterns. On a clock dial, spandrels refer to the ornamentation in the four corner spaces between the chapter ring and the dial plate. See box above. Zinc alloy, often containing lead, used as a substitute for bronze. Spelter was much used in the 19thC for cheap, cast articles such as candlesticks and clock cases. It was popular as an inexpensive medium for art Nouveau applied ornament and art deco figures. Gate-leg table with particularly slender, turned legs, and with more or less standard dimensions of around 28 in (71 cm) high, with a 36 x 30 in (91 x 76 cm) surface. The tables were produced both in Britain and the USA during the second half of the 18thC. Single or pair of cylindrical vases or a wall-hanging vase, designed to hold spills or matches for lighting candles and pipes. Some examples have a rectangular holder for a matchbox. 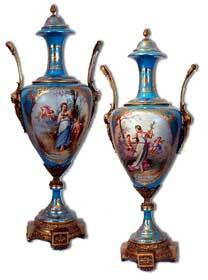 They were made in porcelain, pottery or brass from the late 19thC. Spill vases are also known as paper cases, match vases or match stands. A slender, turned rod based on the shape of a spinning-wheel spindle, which is often seen on the upright members or horizontal stretchers of a chair. Metalworking technique used since Egyptian times to form hollow containers from sheet metal by pressing the metal against a rotating wooden core on a lathe. Also – Technique used to turn wool, cotton and flax into thread suitable for weaving using a spinning wheel, first seen in the 14thC. Centre of silk weaving in London from the late 17thC, at its peak during the 18thC. Many early designs were French-influenced, brought over by huguenot weavers. In the early 18thC velvets, damasks and silk brocade were produced for dressmaking. In the 1770s the industry fell into irreversible decline when patterned materials went out of fashion. See also bizarre silk. Open or conical-topped container made of metal or ceramics used for spitting into. Some are small for hand-held use, others are larger and rest on the floor. The vertical member of a chair back, rising from the seat to the top rail. Spode is a staffordshire manufacturer of pottery and porcelain, based in Stoke-on-Trent. The company was founded by Josiah Spode, who earned renown in the ceramic business for perfecting the blue underglaze printing process in 1784 and for co-developing the formula for fine bone china. He opened a factory in Stoke-on-Trent in 1767 and in 1776 setup the current Spode factory. Early production included creamware, pearlware and blue-printed earthenware. His creamware (a fine cream-coloured earthenware) and pearlware (a fine white-glazed earthenware) was very successful. Spode perfected the bone china formula, and in the 19thC was noted for its regency-style ornamental ware and useful wares with bat-printed designs. William Copeland became a partner in 1833, and then sole proprietor in 1847, when parian porcelain figures were introduced. Finely crafted table services and vases continued to be made into the 20thC. Inexpensive pottery with mottled colour effects applied by a sponge. It was produced and exported in quantity by Staffordshire potteries in the 1820s, and was popular for the next three decades. In the USA it is known as spatterware. The addition of separately made relief ornamentation onto a ceramic body, cemented in place with slip. The clays used for sprigging may be in a contrasting colour to that of the body, but need to be of similar consistency for the pieces to adhere successfully during firing. Sprigging was developed by Thomas whieldon in the early 18thC, then taken up by other Staffordshire potters, notably on Wedgwood jasperware. A Flemish-born huguenot silversmith and porcelain manufacturer who was based in London and specialised in rococo pieces decorated with human figures, dolphins, shells, crabs and various other natural motifs. See chelsea. Light indentations or pimples in a ceramic glaze found on the base or rim of some plates, dishes and figures. They – and the similar stilt marks – are made by cones or pegs used to support the body in the kiln or to prevent stacked wares from sticking to each other. The marks can aid identification; they are characteristic, for example, of chelsea and arita porcelain. See patch marks. A flat, loose cushion, as opposed to fitted upholstery, usually tied to the frame of an armchair with corner tapes and used from the 17thC. Squab stools have a raised rim to hold a cushion in place. Ceramics factory near Paris founded in 1664 to produce faience. Later, in the early 18thC, a separate concern was established producing cream-coloured soft-paste porcelain with a thick glaze. The factory’s peak period was 1725-50. Early pieces were moulded after the Chinese style with prunus boughs or decorated in underglaze blue. kakiemon-style decoration was characteristic after 1730, and many pieces were mounted in silver. The factory closed in 1766. French glassworks founded in the Miinzthal, Lorraine, in 1767. At first it imitated English lead crystal, but c1839 it began to produce original, fine-quality tablewares, elegant ornamental wares made of opalescent and other coloured glass, latticing and paperweights. The factory is still in operation and has revived the production of sulphides. The largest concentration of ceramics factories in Britain since the 17thC. At the heart of The Potteries are the so-called ‘five towns’ (in fact six) of Stoke-on-Trent: Burslem, Hanley, Stoke, Tunstall, Longton and Fenton. The availability of a variety of local clays and coal for fuel provided the essential foundations for the industry to develop. From the mid-18thC, the early pioneering techniques and wares of Staffordshire potters such as Thomas whieldon, John Astbury, the Elers brothers and, above all Josiah Wedgwood, had a profound influence on European ceramics, and an expanding international export trade was established. Almost every stage of British ceramics development can be traced in the Staffordshire potteries, from slip-ware and other lead-glazed earthenware to salt-glazed and fine estoneware, creamware and bone china, embracing both utility and luxury markets. Linked particularly with Staffordshire are the many animal and human figures produced in the 19thC. These were made in moulds by the thousand, often depicting notorious or famous contemporary figures, sometimes marking significant events such as coronations, murders, expeditions or wars. See: Staffordshire Porcelain – Know your antique porcelain collectibles. Glass coloured with metallic oxides, or by flashing. Since the 11thC it has been used for making windows, often in churches. The early technique was to cut the glass into pieces to fit the design, paint faces and draperies with black or grey enamel, and then fix the pieces into a lead framework, hence the term ‘leaded light’. By the 16thC larger panels of glass were being used and the design was painted on in coloured enamels. Stained glass began to appear in houses from the 14thC. Medieval styles and techniques were widely imitated until the late 19th and 20th centuries, when designers such as Sir Edward Burne-Jones and William Morris in Britain and John La Farge and Louis Tiffany in the USA experimented with new applications and designs. British engineer, painter and studio potter whose best work is seen in large, simply decorated vases, influenced by the Japanese potter Shoji Hamada, and by his contact with potter Bernard leach. 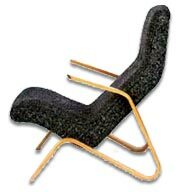 Mart Stam was a Dutch architect, urban planner, and chair designer. Stam was extraordinarily well-connected, and his career intersects with important moments in the history of 20th century European architecture, including chair design at the Bauhaus, the Weissenhof Estate, the "Van Nelle Factory", an important modernist landmark building in Rotterdam, buildings for Ernst May’s Weimar Frankfurt housing project then to Russia with the idealistic May Brigade, to postwar reconstruction in Germany. Impressing a design or mark into a ceramic or metal body with a stamp. See die-stamping. Also – The process of pressing low-relief ornamentation made separately in an intaglio mould onto a ceramic body, fixing it with a liquid clay slip and firing. Large, ceremonial drinking vessel, used in Britain and other parts of Europe from the Middle Ages to the 17thC and later copied for display. They were made of silver, silver-gilt, copper-gilt, or pewter, and consisted of a covered bowl resting on a knopped stem, supported by a spreading foot. Very elaborate examples incorporated real coconut shells, sea shells and ostrich eggs. Chinese drinking vessel with a wide shallow bowl and a stem widening at the base, also known as a gaozu. Most stem cups are of porcelain and became popular in the ming period, but earlier examples exist. A simple method of decoration in which a design or lettering cut from card or other material is used as a template for reproducing a pattern onto a surface placed below. Stencils were used from the 17th to the 18th centuries to decorate walls and were popular during the arts and crafts movement as a furniture decoration. A 19thC instrument for viewing two drawings or photographs of the same object, pictured at slightly different angles, to produce a single, three-dimensional image. It was invented by British scientist Charles Wheatstone in 1838. The proportion of pure silver to base metal set for British sterling silver. From 1300, apart from the period 1697-1720, when the britannia standard was enforced, the legal standard has been 92.5 per cent pure silver, the remainder being one or more base metals such as copper, to lend strength and workability. See Collecting Antique Silver. Leading US glass factory founded by English designer Frederick carder in 1903. It was taken over by the corning glassworks in 1918, but continued to produce vast quantities of art glass. From the mid-1930s the factory specialised in lead crystal, ornamental wares including commissioned designs from various artists and sculptors such as Jean Cocteau, Salvador Dali, Eric Gill and Graham Sutherland. Trade name for English silk pictures made by Thomas Stevens of Coventry on a Jacquard loom, 1879-1938. They are approximately 2½ x 6 in (6 x 15 cm) and followed themes such as horse races, transport and portraits of famous people. Family firm of glass-makers based at Brierley Hill near stourbridge, established in the 17thC. In the 19thC, the firm was one of the top three factories in the Stourbridge area, alongside richardsons and Thomas webb. Products included cameo, lead crystal, engraved and many coloured glasses. In the 20thC, the firm changed its name to ‘Royal Brierley’ after receiving a royal warrant in King George V’s reign, and has become known for its commemorative glassware. The simplest and earliest type of barometer, invented in the 17thC. It consists of a mercury-filled glass tube set within a long, narrow wall case. The mercury level is read directly against a simple vertical scale. Elastic, machine-knitted, silk or fine cotton fabric used 1860-80 and 1920-40 as a material for dolls’ bodies. It is also seen, though rarely, stretched over the head of a papier mâché doll. A decorative, often elaborately embroidered or jewelled, triangular panel of material inserted into a bodice on a woman’s dress and worn over the chest and ending in a point over the stomach. Stomachers were a feature of women’s dresses from the late 15th to late 18th centuries. Also – A large, triangular brooch worn from the 18thC on the centre of a woman’s dress bodice. Some were made in sections to be worn as a sequence of two or three brooches. Stomachers, also known as devant le corsage or corsage brooches, were especially popular in the Edwardian period. An extremely hard, white clay body used for heavy-duty table services, which was developed in the early 1800s at various Staffordshire potteries. The body is opaque and covered in a glaze with an often blue-grey tinge, and the design is painted over a blue, black or puce printed outline. Popular styles include those derived from Chinese famille-rose export services or anglicised versions of imari porcelain patterns. Ironstone china’ was a term patented in 1813 by Charles Mason, possibly in a bid to corner the market and to mislead competitors. Analysis suggests that the slag iron purported to be part of its make-up, is not actually present. While Mason’s (later Ashworth’s) was the main producer of ‘ironstone’, other Staffordshire factories followed suit. One of the three fundamental ceramic bodies, the others being earthenware and porcelain. Stoneware is a very hard, dense material made from a clay fired to a point at which the individual grains of clay fuse together, rendering the finished product impervious to liquid. The manufacture of stoneware was first introduced to Britain from Germany in the late 17thC. Glass-making centre in Worcestershire. Glass factories were established there in the early 17thC by a group of huguenot glass-makers. It was the most important 19thC English producer of fine table and decorative glass, including coloured, lead crystal, engraved and cameo glass. See Thomas webb & sons, stevens & williams, richardsons. Decorative motif incorporating interlacing bands or ribbon-like straps. It was popularised by illustrators and engravers in 16thC Flanders, and was a feature of Elizabethan style. Strapwork designs are seen in wrought-iron work, carved in low-relief on furniture, stamped, cast or engraved on silver, and painted on ceramics. The German version, laub und bandelwerk, is seen on early meissen porcelain. See decorative motifs. Decoration using short coloured lengths of straw to form marquetry pictures or patterns and applied to items such as furniture, boxes and mirrors. It was popular from the 17th to 19th centuries, particularly in France. The horizontal bar or rail that connects and supports the legs of chairs, stools, cabinets and tables. Stretchers are found in a variety of styles on the lower part of the leg on 16th and 17thC furniture. By the early 18thC they were used only on a limited basis, and by the end of the century they were considered unfashionable. The blows struck on bells, or gongs of coiled wire, to sound periods of time on a clock. Hour striking sounds the number of hours at each hour, whereas a passing strike sounds one blow at each hour. A half-hour or French strike is hour striking with an additional single blow at each half-hour. Quarter striking is also hour striking with the addition at each quarter-hour of either a double blow on a smaller bell or six or eight blows on a nest of bells. The term chiming indicates a quarter strike on a nest of bells and should not be used to refer to the hour strike. A grande sonnerie strikes the hours and the quarters at every hour and quarter-hour; and a petite sonnerie strikes the hours only on the hour and successive quarter-hours by single, double or triple ‘ting-tang’ on two bells. A Dutch strike counts out the hour both at the hour on one bell and at the previous half-hour on a differently toned bell. Small, slim, bedroom or travelling clock, with an easel-like strut behind, or sometimes with a swivel strut at the base. The clock was introduced c. 1845 by Thomas Cole (1800-64) and was produced by various clock-makers to c. 1880. An Italian term for a slow-setting plaster composed of gypsum, sand and marble powder. It is used for sculptures and relief decorations on walls and ceilings. Ceramics made or decorated by independent artist-craftsman. Type of needlework in which layers of buttonhole stitching and sewn-on decorations such as seed pearls create three-dimensional ‘stump’ pictures. Combined spoon and fork, the two-pronged fork being at the tip of the spoon handle. It was used mainly to eat succade – preserved fruit, either in syrup or candied. Most surviving examples are of 17th – 18thC. French furniture-making company operational 1919-28, officially known as the Compagnie des Arts François, but better known by the surnames of its two founders, Louis Süe and André Mare. Its high-quality art deco furniture made of luxurious materials was usually commissioned, and the company also designed interiors and decorative objects. A box with a lid used for holding and serving sugar. Some examples have two compartments for different types of sugar as well as room for a spoon. Sugar boxes are found in silver or porcelain. Early type of sugar tongs like a pair of scissors but with arms instead of blades. Sugar nips were introduced in the mid-18thC for breaking pieces off sugar loaves. White ceramic cameos and medallions embedded in clear glass, a technique believed to have been first patented in 1818 by Pierre-Honoré Boudon de Saint-Amans. A thin layer of air under the glass gives them a silvery appearance. Sulphides are seen set in paperweights, in the base of goblets, perfume bottles and tumblers, and were widely produced in the early 19thC. Fine examples were made by baccarat, clichy and Apsley pellatt. A flat-weave technique used in Oriental rug-making, with a complicated, almost embroidery-like weave. The sumakh or soumak technique is widespread in the Caucasus, seen in the similar verneh and sileh rugs of the southern Caucasus, and also in the wearings of the nomadic Turkoman tribes in eastern anatolia, Iran and other parts of central Asia. Domestic pottery such as chamberpots, jugs and plaques made in large quantities in Sunderland, England, 1800-50. It is decorated with black transfer-printed designs of sailing boats, bridges, emblems and inscriptions, some hand-coloured and framed with splashes of purple-pink lustre. Device for telling the time by the sun. The dial has a central protruding arm known as a gnomon, and as the sun rises the shadow cast by the gnomon indicates the time on markings round the edge of the dial. A pocket sundial known as the Butterfield dial – invented by Michael Butterfield (fl. 1670-1724) and made of silver or brass with an octagonal base and adjustable bird gnomon – was widely copied up to the late 18thC. Both pocket and fixed sundials were widely used from the 15th until the mid- 19th centuries, after which accurate pocket watches and the introduction of standard time made them obsolete. A mid-Victorian, drop-leaf table with a central section that is unusually narrow compared with the broad leaves, and a gate-leg construction beneath. Japanese lacquer box used for writing materials (suzuribako means ‘ink-stone box’) dating from the 13thC onwards. The process of shaping the edge of a piece of silver flatware or other metal using a tool called a swage block which consists of compatible blocks – one with the edging design in relief and the other with the design recessed. The metal edge is pressed between the blocks to mould the metal. The process is still used today to make hand-forged spoons. The most important pottery and porcelain centre in South Wales in the late 18th and early 19th centuries. The Cambrian Factory, producing creamware earthenware and basaltes EARTHENWARE. Was active from c. 1767. But it was for the finely modelled and decorated, high-quality soft-paste porcelain produced from 1814, with the help of William Billingsley from Nantgarw, that Swansea became famed. From 1822 the factory produced only earthenware and finally closed in 1870. Dry sweetmeats such as chocolates, nuts and dried or candied fruits, were popular from the 17th to early 19th centuries, and various containers – in silver, glass and ceramics – were made to hold them (see bonbonniè). Porcelain sweetmeat figures carrying a bowl were made as part of dessert services notably at meissen and chelsea. A sweetmeat dish is one dish with several compartments. A sweetmeat set is made up of separate containers, usually sections of a circle, which when placed together form a composite piece. These were popular in the late 18th to early 19th centuries. Tall-stemmed sweetmeat glasses were used in Britain in the late 17th and early 18th centuries for ‘wet’ sweetmeats such as jellies and custards. They are more usually known as jelly glasses. See also epergne. General term for any weapon with a handle and a long blade used for cutting and thrusting. It encompasses the lightweight rapier, the two-handed claymore, and the curved-bladed sabre. Swords carried by foot soldiers are shorter than those for mounted soldiers. Simple crossguards gradually gave way to knuckle-guards for greater hand protection in late 15thC Europe. Rapiers, and their direct descendants, the small swords, were carried for personal protection or as part of court dress, rather than in a military context, from the 16th to18th centuries. Swords were still standard sidearms for some armed forces in Europe into the early 20thC, but apart from their continuing role as part of a dress uniform, they were replaced by bayonets from the 18thC. Hard, milky-white, European wood, related to the North American maple. It has a fine, even grain and natural lustre. Solid sycamore furniture was made in medieval times, and from the late 17thC the wood was used in floral marquetry on walnut furniture, sometimes stained green or grey to make harewood, and for veneers. Because it has no taste, sycamore was much used for domestic ware. Wide-bowled, stemmed, 18thC glass used to serve syllabub, a creamy dessert. Type of barometer used for measuring air pressure, comprising a short column of mercury and a bulb of gas, mounted in a brass or wooden wall case. It was widely made in the 1820s and 30s.